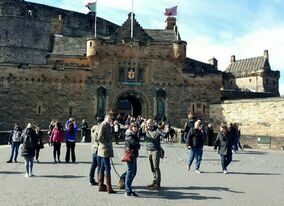 A fantastic introduction to Edinburgh ... full of quirky historical details and stories! Book a bespoke package for a tour fully tailored to you, with a route and content curated to showcase the city in the best possible way to suit your interests and needs! PLUS you get exclusive access to my online Edinburgh Essentials information directory, to help you plan your visit and find things to do in Edinburgh before you even arrive! As a rough estimate, we will cover a minimum of 1 mile/1.6 kilometres of distance for each hour we walk. Longer tours will give us time to escape the tourist trail and move away from the crowded city centre to explore historic outlying areas where visitors rarely venture. Check out these sample itineraries to get an idea of what the different tour options may offer - but as each tour is tailored to you, every tour is different! My Edinburgh Essentials information directory has over 50 pages of information, tips and advice to help you plan your trip. From restaurant suggestions to shopping tips, details about the city's main attractions, and ideas for things to see and do outside of Edinburgh, you can get all the information you need to make sure you don't waste a single moment of your visit to Edinburgh!